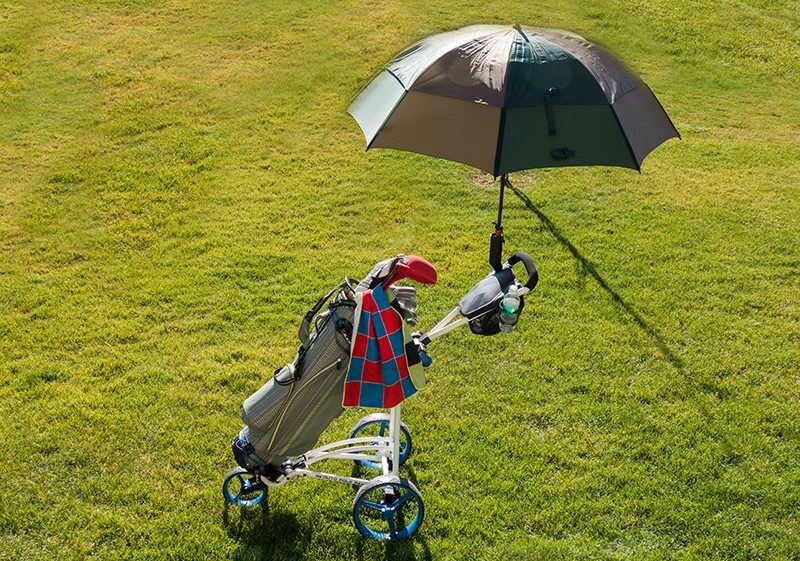 I love to walk when I golf, but with a bad back I don’t carry my bag that often. 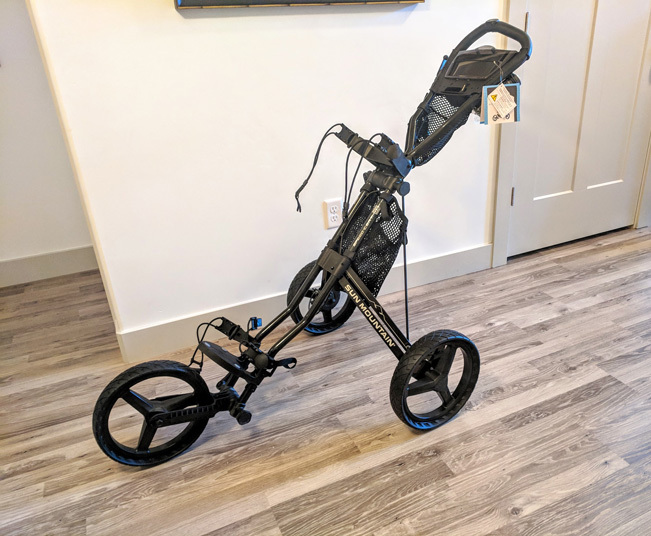 So I like to use a push cart (“trolley” for my friends in the UK). I’ve had the BIG MAX Auto-Fold FF unit in play since this summer and put it through a very rigorous test battery. Yes, being one of the world’s top golf bloggers can be rough. You know, having to play golf and “evaluate” great golf equipment, apparel, and accessories. I do it for you, the HOG patron. Now let’s take a look at the BIG MAX Auto-Fold FF cart/trolley. 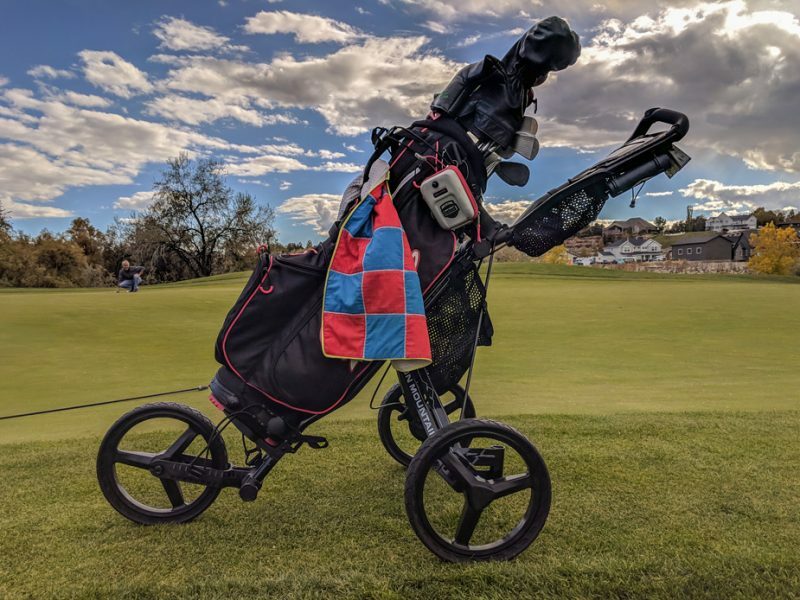 The BIG Max Auto-Fold FF (okay that’s taking a lot of typing, so let’s call it the BMAF from this point on) is a 3-wheel push cart/trolley designed to make walking the course easy. The two rear wheels are large and wide and the front wheel a little smaller but still a wide tread. 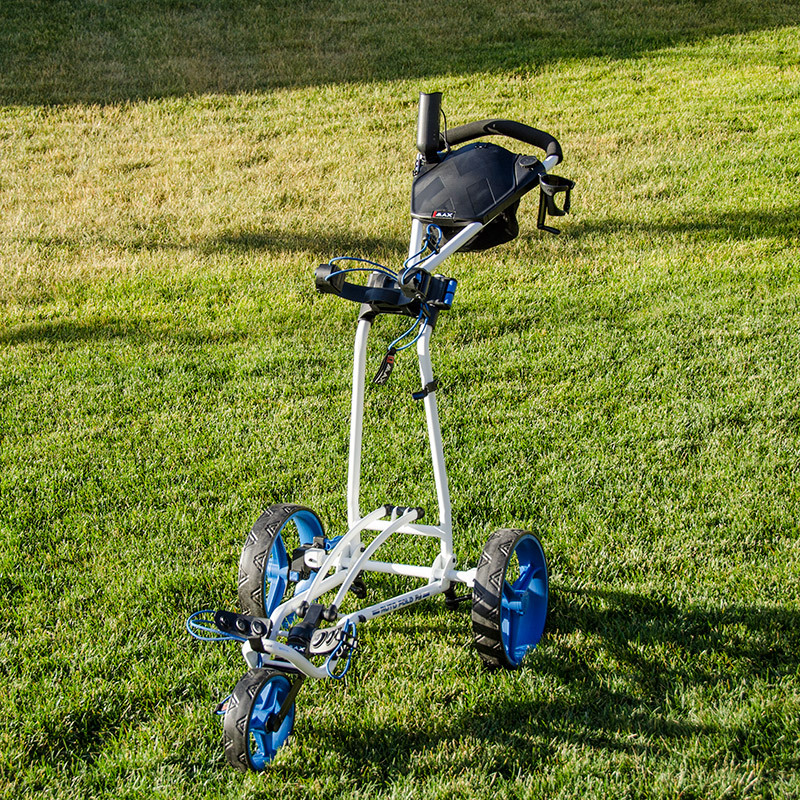 The wheels and wide wheelbase help the unit push very easy and ride very smoothly. I have a few other trolleys which shorter wheelbases and smaller wheels, and those designs seem to accentuate bumps and hills. The BMAF handles bumps and hills much better. The frame of this unit is extremely solid and sturdy. Big Max makes many push carts for the rental pool of courses, and those must be tough. That knowledge and experience in design carries into the BMAF. That said, the unit is still quite light and easy to lift into the trunk of my car. 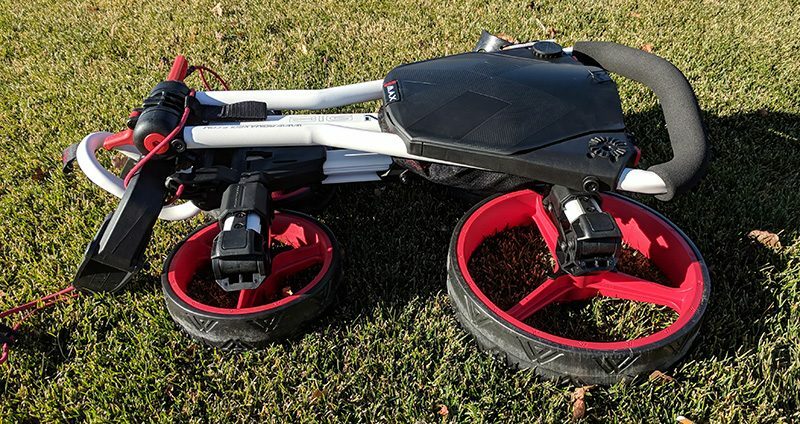 When folding up, the two rear wheels can be easily removed. The handle is big and solid with nice padding. That helps to make pushing the unit and steering it easy. 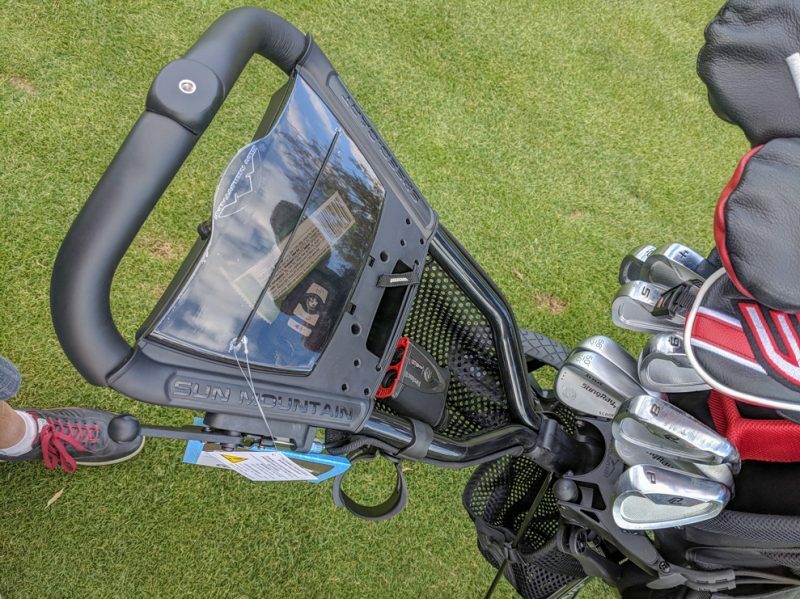 The golf bag is secured onto the cart with some nice and easy to use thick bungee cables with solid hooks. It’s a good way to secure the bag. The unit can cary bags up to the large “tour” size. Speaking of the trunk, the unit folds for storage and transportation. Folding is very easy. In fact, no “latches” or buttons or anything else need be manipulated to fold it. Just grab the front wheel and pull up and it folds nicely. 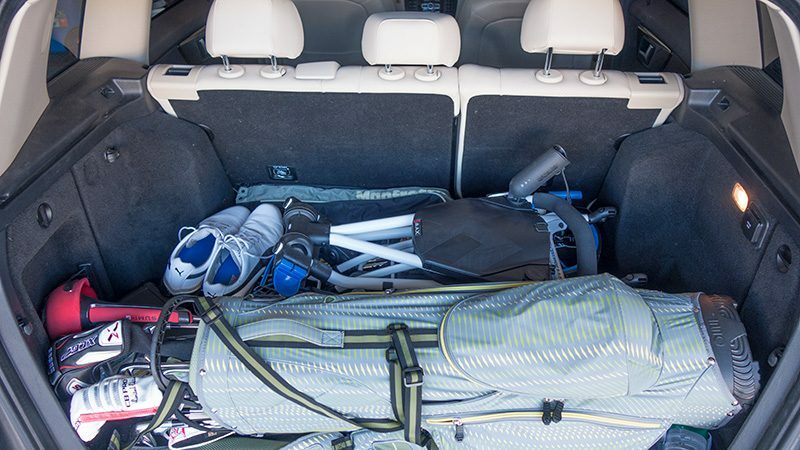 I don’t have a large space in my trunk yet the folded unit still fits easily with my clubs (photo below). 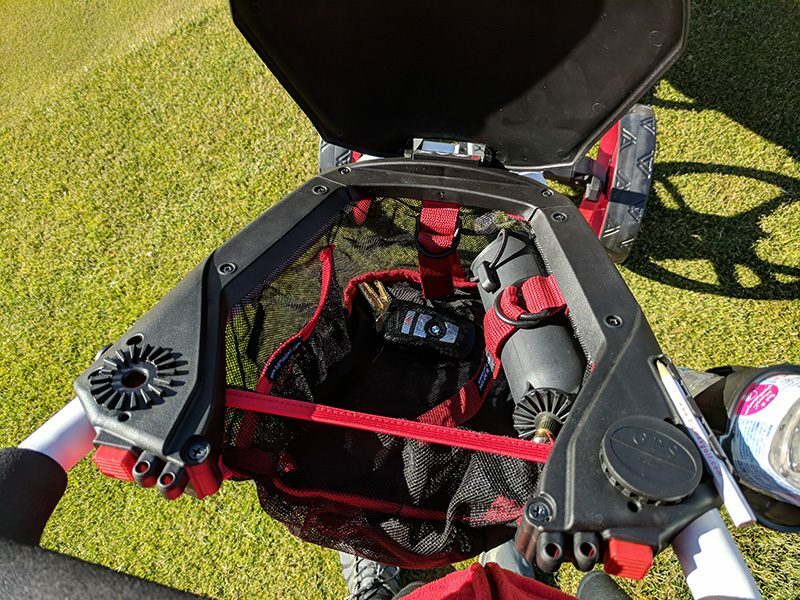 The accessory compartment (photo below) is located underneath the scorecard holder, conveniently behind the main handle. The pouch is very large. I bet it would easily hold 3-4 dozen golf balls. I put my GPS, phone, camera, sunglasses, cigars, cutter, tees, glove and small children in there. 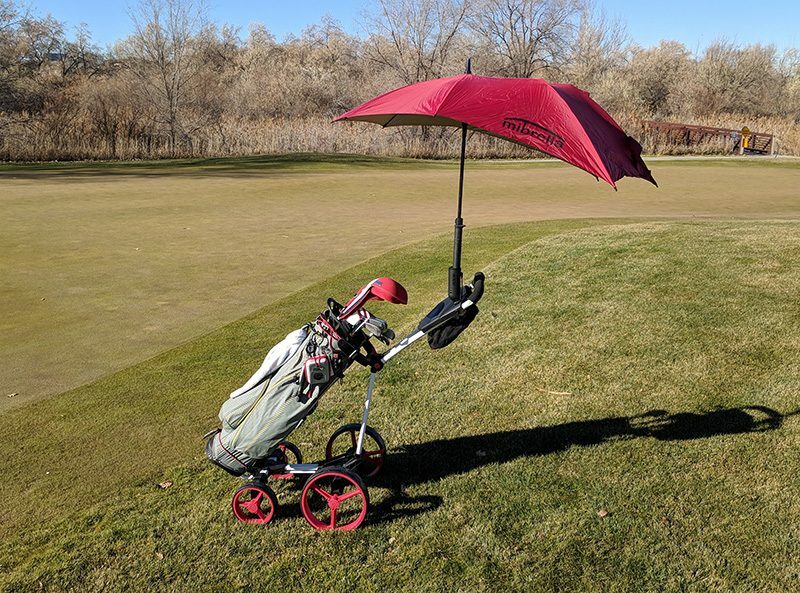 There is an umbrella mount (main photo). That’s great to have for not only when it is raining, but when it is bloody hot here in the desert. I’ll put up the umbrella to give myself shade. 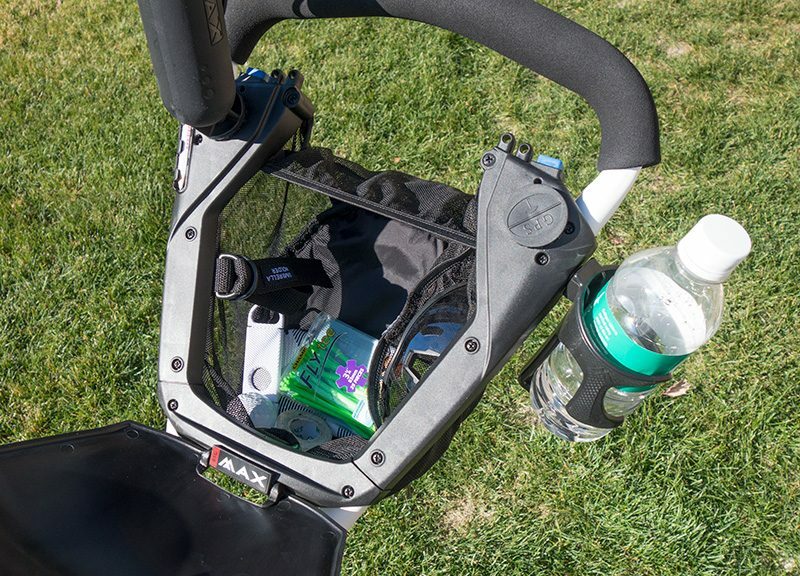 A drink holder connects to the side of the handle with a “quick lock,” along with a GPS holder. Both are conveniently located for easy access. 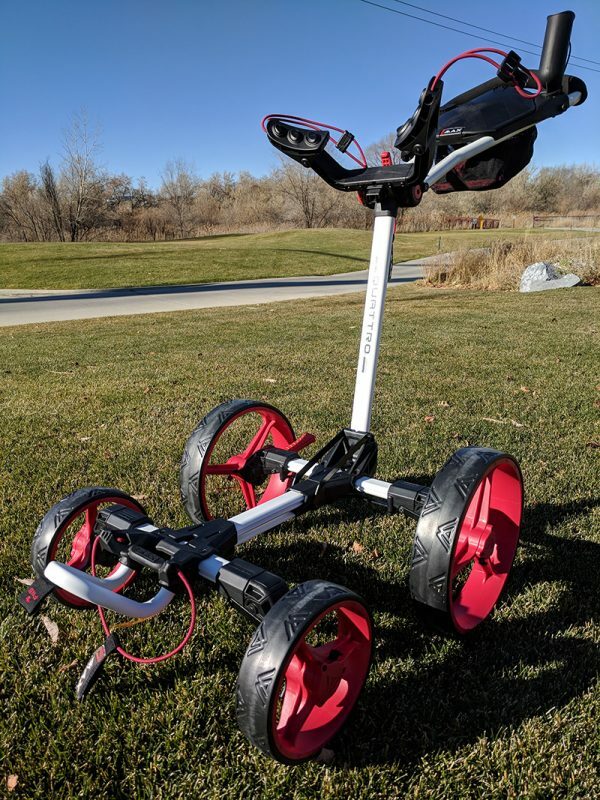 The overall experience of using the Big Max Auto-Fold FF trolley is fantastic. It is extremely easy and enjoyable to push, despite its large footprint. 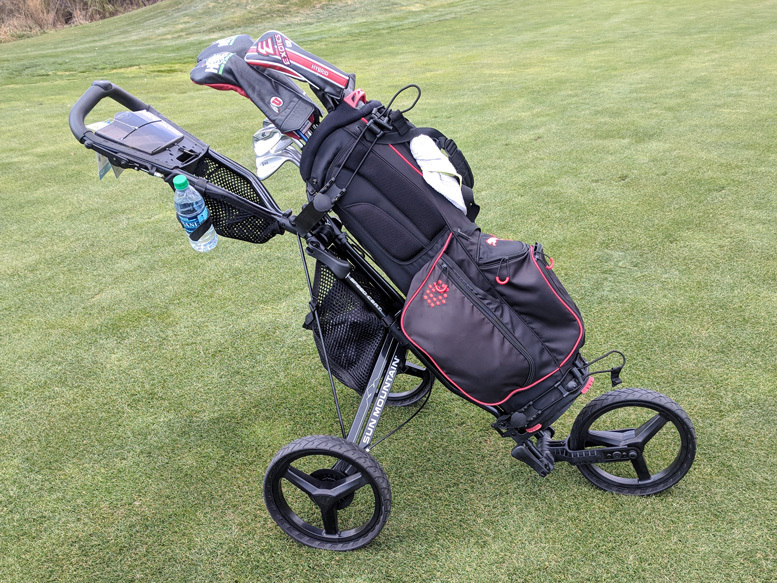 It rides smoothly and provides a very solid and stable platform for my golf bag and all the rest of the stuff I bring onto the course. On my next Scotland trip I might ship my Big Max there in advance!